There's another price reduction from Camper & Nicholsons as Miriam Cain sends the news that Jeremy Comport's central agency listing, Palmer Johnson's 43.3m superyacht Pure Bliss, is now priced in dollars rather than Euros. Built in 1997 with a Terence Disdale interior and refitted in 2009, the mega yacht sleeps 12 guests in five staterooms and has an extensive sundeck with a large Jacuzzi and sun pads. 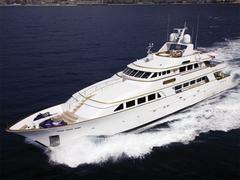 Previously asking €8.5 million, she's now on the market at $10.9 million.